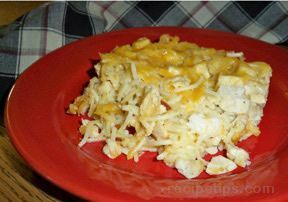 A food dish consisting of a base of cooked pasta (generally spaghetti) that has been combined with strips or chunks of poultry (most often chicken or turkey), and a cream sauce made with sherry and Parmesan cheese. The ingredients are then covered with a topping of breadcrumb or grated Parmesan and baked in a casserole dish. 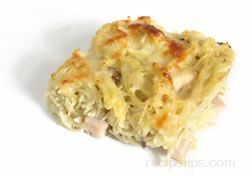 Although the meat used for Tetrazzini is typically poultry, there are many versions of this recipe using different types of meat, such as ham, as one of the main ingredients.